Naomi Campbell is featured in Private Dancer photographed by Daniele and Iango and styled by Joanne Blades for V magazine March 2012 issue. 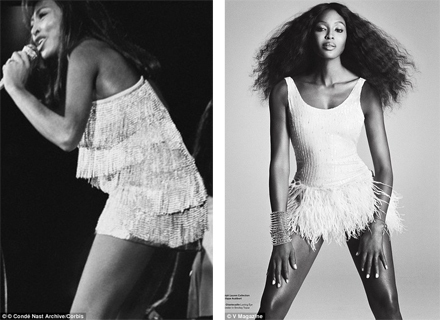 Fringed dresses and rock-and-roll style minidresses are flawless on Naomi as she stunningly channels great Tina Turner. This particular issue of the magazine is somewhat strange, given that it is otherwise dedicated to sports, but regardless, Naomi Campbell looks gorgeous in the black and white pics. 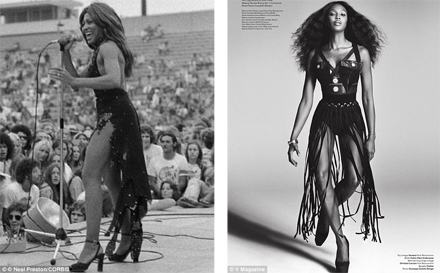 Naomi Campbell strikes a rock ‘n rol garments for a full transformation into Tina Turner. Like Tina Turner, Naomi Campbell has a toned up body that would make even the most ardent gym-goers jealous. Kicking her legs in the air and waving her arms, she shows of her inner dancer image. Tina Turner is famous for her gruff voice, her incredible stage presence and most of all for her strength of spirit during her loud marriage to Ike Turner, as captured in the 1993 movie What’s Love Got to Do With It, starring Angela Bassett. 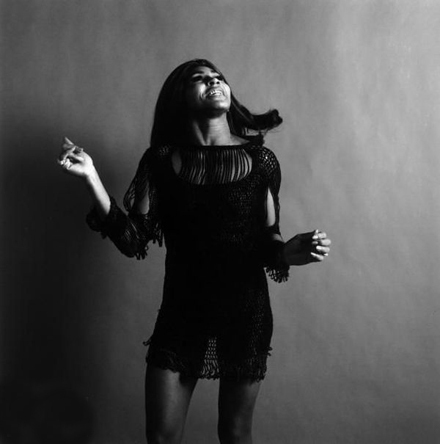 Soul Sister, a new musical inspired by the life of Ike and Tina Turner, is to be premiered at London’s Hackney Empire, with performances on April 14, and its official opening is on April 19.